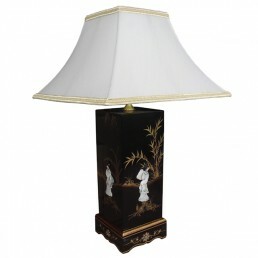 This range of traditional style Chinese table lamps will brighten up any room with a feeling of the Orient. 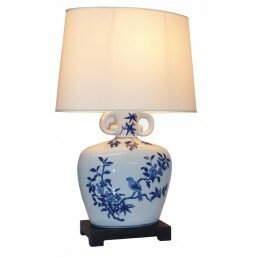 They are ideal for a traditional styled room or perfect as a unique feature in a modern decor scheme. 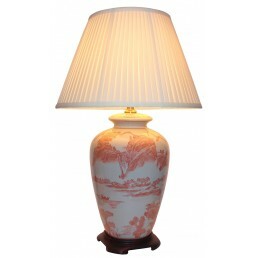 These Oriental table lamps have a porcelain base and include the lampshade as shown in the photographs. 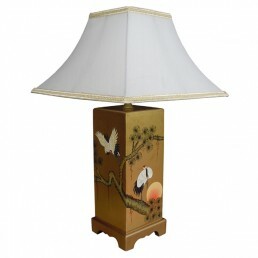 The base are hand-decorated with beautiful scenes of traditional Chinese designs inspired from the ancient Chinese style. Many of the lovely designs include birds, dragons, butterflies, goldfish, flowers and scenery. 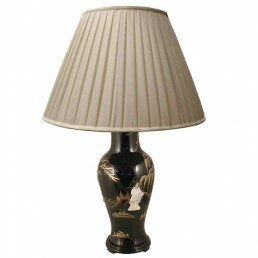 All of our Chinese lamps are fitted with plugs and conform to UK & EU safety regulations. The lamps have brass fittings with a switch on the lead and have a regular UK bayonet B22 lamp holder. For European orders we provide a free B22 to E27 bulb adaptor. Buy online - UK stock - Quick Delivery. These lamps are sold individually. 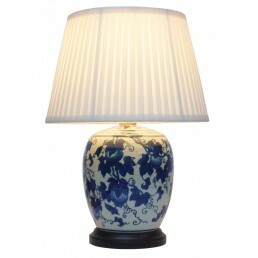 The Bai Mei lamp is made from the Bai Mei Ginger Jar and is part of the Ashmolean collection. Dec..
Square bottle lamp in mustard brown with double happiness shuang xi character stamped amid frieze..
Vase lamp made from red/cream porcelain with goldfish design and white shade. 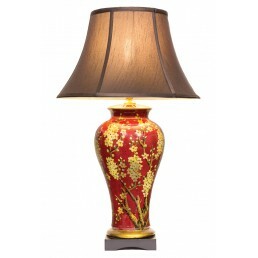 Price for sing..
Vase lamp in rich red with jasmine blossom. 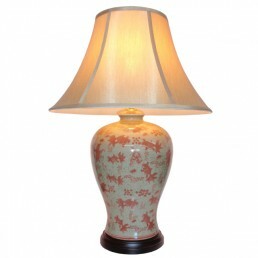 Lamp base height: 38cm - 15in. 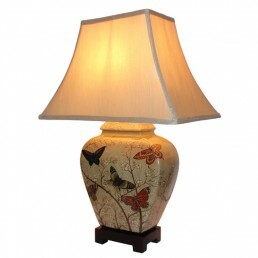 Shade diameter:..
Jar Lamp in cream with coloured butterfly and blossom design. 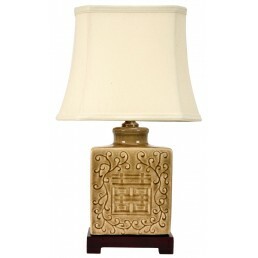 Price for single table lamp. 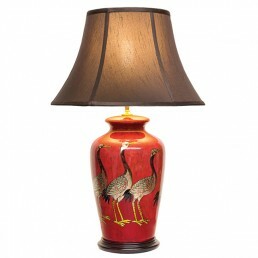 ..
Vase Lamp in rich red with cranes in metallic finish. 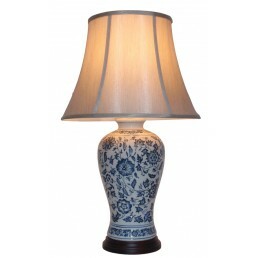 Price for single table lamp. 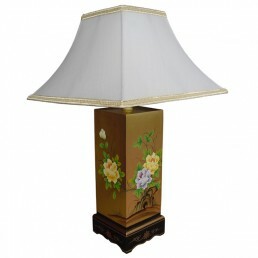 Lamp..
40cm ceramic lamp with gold leaf design and square white coloured shade. 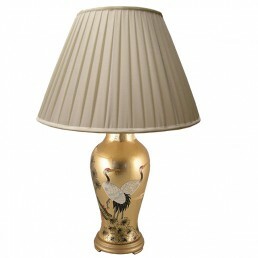 PRICE FOR SINGLE LA..
40cm ceramic lamp with gold leaf design and round cream coloured shade. 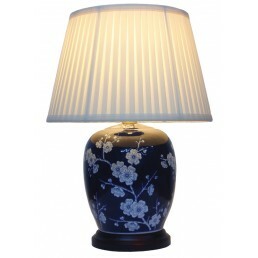 PRICE FOR SINGLE LAM..
40cm ceramic lamp with mother of pearl design and round cream coloured shade. PRICE FOR SING..